Once upon a time, a “craft brewery” meant a small operation. That’s no longer the case, now that many craft brands are owned and operated by macro-breweries and many other craft brewers have gone national on their own. Nevertheless, the Charlotte beer scene has seen a batch of worthy micro- and nano-breweries crop up over the last year. The recent proliferation has led to a discussion about if and when the local beer bubble will burst. Do small, independent operations stand a chance against the bigger craft beer makers that are already dominating the regional market? Signs point to yes. These new, small breweries are bringing quality beers to the table, and each one occupies a niche that goes unserved by “big box” beer, craft or otherwise. Wesley Heights’ first brewery has quickly become a neighborhood anchor, thanks in part to how thoroughly and reliably it covers its bases. 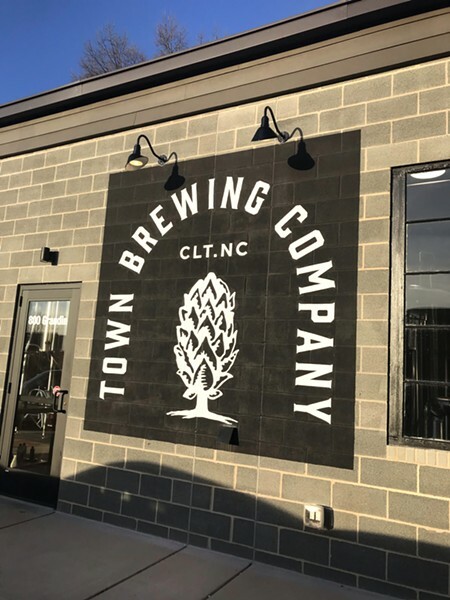 Town Brewing Company boasts a full kitchen with quality seasonal food, fairly cozy indoor and outdoor seating, and ample space to host events – not to mention an accommodating beer list. “My goal with Town’s beer line-up is to produce a wide range of styles that appeal to casual craft drinkers as well as the biggest beer nerds. A mix of approachable and more experimental beers. Something for everyone,” said head brewer Brian Quinn. This is an appropriate move for a spot that attracts a solid mix of people including families, partiers, and earnest Untappd users. Quinn points out that this is a great thing about breweries – their ability to serve as de facto community centers. Town Brewing also deserves credit for being more comfortable than your average start-up brewery. Let’s face it – a lot of them, even those we know and love, leave something to be desired in the charm department. (Cheap metal chairs and mass-produced art in a drafty warehouse, anyone?) In its location next to Rhino Market, Town maintains that familiar industrial vibe, upgraded with booths, real food, and tasty beers. 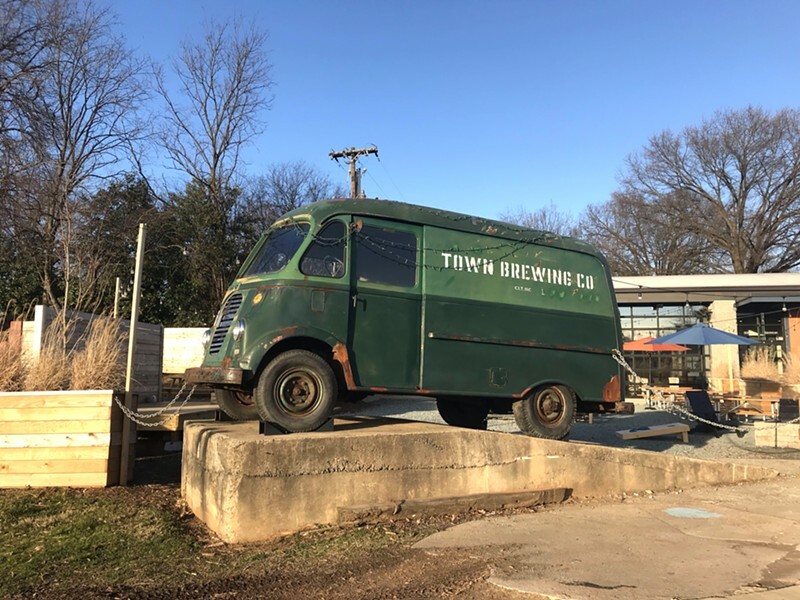 You’ll have to know where to look to find this Plaza Midwood brewery; its dark sign and tucked-behind-Yafo-Kitchen location make it easy to pass by. But this self-described neighborhood nano-brewery isn’t one to miss if you’re into one-of-a-kind beers. Pilot is small and experimental, but don’t confuse that with amateur. Owner and head brewer Rachael Hudson is an industry veteran with experience at Hardywood Park, Left Hand, and NoDa Brewing Company. 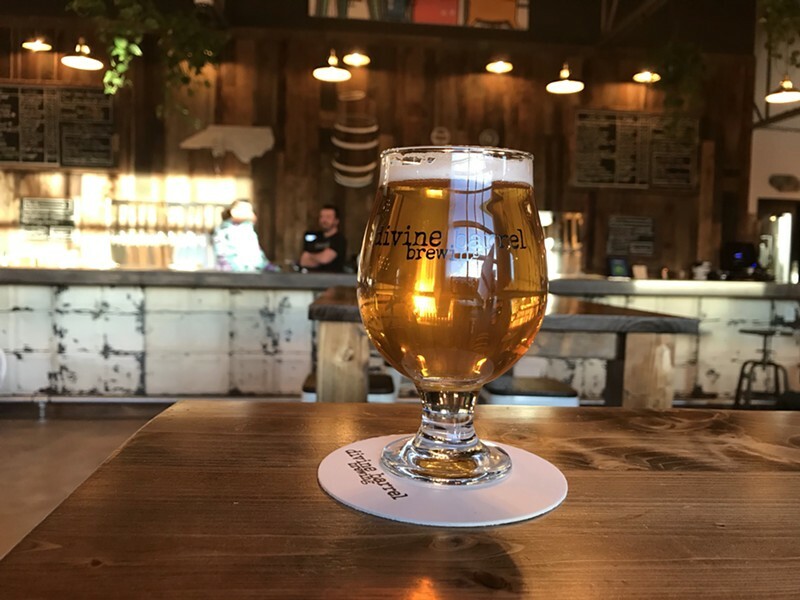 Since opening in August, Pilot has churned out a couple of medal-winning brews (Trappist-style single Belgian-style ale and the Grodziskie Ale) which both took silvers for their categories in the 2018 NC Brewer’s Cup Competition. Brewing small batches also allows Pilot to take more risks in recipe development. Guests will never be bored with its always-rotating draft selection, and the staff has more fun, too: every member of the Pilot team has some level of Cicerone certification, and splits their time between brewing and bartending. Divine Barrel’s name indicates a reverence for its craft that’s also evident in the quality of its brews. The NoDa brewery is getting ready to celebrate its first anniversary in March. It already has one major milestone under its belt – a silver medal at the Great American Beer Festival last September, which is the country’s largest and most well-established beer competition. Divine’s “The Big Lubelski”, a Polish-style Gratzer, won silver in the Historical Beers category. This light but flavorful beer kills it with a mild sweetness, wheatiness, suggestion of funk, and an all-out perfect thread of smoke. It gets its character from oak-smoked wheat malt and Polish Lubelski hops. (Side note: If there’s a food truck outside selling Polish sausages, go for the pairing. It’s a wonderful iteration of the time-honored combo of beer and hot dogs.) The lineup of beers (12 taps) hits to all fields. “We don’t have any flagship beers, per se, but we do have what we consider flagship styles,” said Ben Dolphens, co-founder and head brewer. “We do our best to always have a west coast IPA, a hazy IPA and a fruited sour on tap, and then fill in the rest of the list with whatever happens to inspire us at the moment.” In the future, he also plans to expand their lager line up, while continuing to toe the line between experimental and traditional. Protagonist Clubhouse, a two-barrel nanobrewery and taproom, is slated to open in NoDa this spring. Protagonist expects to offer a handful of experimental and even educational beers developed by Head Brewer Jeremy Claeys, most recently Head R&D Brewer for Asheville’s Wicked Weed Brewing. Beverage Director Chris Westgard, an Advanced Cicerone formerly of Huntersville’s Craft Beer Guys bottle shop and taproom, will be tasked with curating the remainder of the Clubhouse’s 24 taps. Protagonist also expects to build a larger facility in Optimist Park, but those plans are still in their early stages. Charlotte’s beer acolytes are also looking forward to Southern Strain Brewing Company opening doors in Concord. This Brumley Street brewery is the work of Bart Roberts, another of NoDa Brewing Company’s former brewers, along with Jake Allen and Ford Craven. Craven founded the Cabarras Homebrewers Society in 2011 and has been driving the conversation about local beer via the Cheers Charlotte podcast since 2013. Last but not least, Middle James Brewing is expected to open its door as Pineville’s first brewery in the coming months. Middle James has a large space to fill (a former billiards and darts hall) but since its the product of yet another partnership between Andrew Viapiano, Michael Smoak, and Shannon Wallace – an experienced Charlotte brewer, an award-winning homebrewer, and a hospitality expert, respectively – big things are anticipated. Emily Ferron is a community-minded writer with an endless appreciation for good food, drinks, and jokes. IG: @emilykateferron / www.emilyferronwrites.com.